All shuttle routes stop at the UC Davis Medical Center's Transit Center, located on "X" St. If your destination is serviced by another route, you may transfer to the appropriate shuttle from this terminal. Click on the tabs below for route information. Gold Line service is available from 5:30 a.m. to 5:00p.m., Monday – Friday. Shuttle runs every 10 minutes. 7:15 a.m. – 4:45 p.m.
* Call 916-734-2687 to request pick up. Blue Line service is available from 5:45 a.m. to 5:00p.m., Monday – Friday. Shuttle runs every 7-10 minutes. Kiwanis House/Lot 25 Every 30 minutes (15 minutes and 45 minutes after the hour) beginning at 7:45 a.m.
Green Line service is available from 6:10 a.m. to 5:34 p.m., Monday - Friday. Green Line is a fixed-schedule route. *Due to low demand, the Cypress Building (RT Bus Stop) is now pick up by request only. Please call 916-734-2687 to request pick up. (RT Bus Stop) 39th St.
8:31 a.m. -- 8:34 a.m. 8:41 a.m.
8:50 a.m. -- 8:54 a.m. 9:01 a.m.
9:10 a.m. Please call 916-734-2687 to request pick up 9:14 a.m. 9:21 a.m.
9:30 a.m. -- 9:34 a.m. 9:41 a.m.
9:50 a.m. -- 9:54 a.m. 10:01 a.m.
10:10 a.m. -- 10:14 a.m. 10:21 a.m.
10:30 a.m. -- 10:34 a.m. 10:41 a.m.
10:50 a.m. -- 10:54 a.m. 11:01 a.m.
11:10 a.m. -- 11:14 a.m. 11:21 a.m.
11:30 a.m. -- 11:34 a.m. 11:41 a.m.
11:50 a.m. -- 11:54 a.m. 12:01 p.m.
12:10 p.m. Please call 916-734-2687 to request pick up 12:14 p.m. 12:21 p.m.
12:30 p.m. -- 12:34 p.m. 12:41 p.m.
12:50 p.m. -- 12:54 p.m. 1:01 p.m.
1:10 p.m. -- 1:14 p.m. 1:21 p.m.
1:30 p.m. -- 1:34 p.m. 1:41 p.m.
1:50 p.m. -- 1:54 p.m. 2:01 p.m.
2:10 p.m. -- 2:14 p.m. 2:21 p.m.
2:30 p.m. -- 2:34 p.m. 2:41 p.m.
2:50 p.m. -- 2:54 p.m. 3:01 p.m.
3:10 p.m. Please call 916-734-2687 to request pick up 3:14 p.m. 3:21 p.m.
3:30 p.m. -- 3:34 p.m. 3:41 p.m.
3:50 p.m. -- 3:54 p.m. 4:01 p.m.
4:10 p.m. -- 4:14 p.m. 4:21 p.m.
4:30 p.m. -- 4:34 p.m. 4:41 p.m.
4:50 p.m. -- 4:54 p.m. 5:01 p.m.
5:10 p.m. -- 5:14 p.m. 5:21 p.m.
Monday through Friday, the Ronald McDonald house is serviced by the Gold line according to the following schedule. For service after hours or on holidays, see instructions below. After hours shuttle service to Ronald McDonald House is available 5:00 p.m. to 11:45 p.m. Monday through Friday. For service after hours, call 916-734-2687. For shuttle service on weekends and holidays, call 916-734-2555. The Midtown shuttle is available from 5:40 a.m. to 5:40 p.m., Monday - Friday. Updated as of November 13th 2017. On request drop offs/pick ups are allowed on Stockton Blvd. at the Cypress building. No other deviations will be permitted. For service information, call Parking and Transportation Services at 734-2687. 5:30 a.m. to 8:30 a.m., Monday – Friday. 5:45 a.m. to 8:30 a.m., Monday – Friday. 7:30 a.m. to 8:30 a.m., Monday – Friday. For service between 8:30 a.m. and 5:00 p.m., please use the Blue Line. To ride the shuttle, simply wait at one of the designated shuttle stops. A shuttle will stop within the designated timeframe. If your stop is by request only, you may use the phone (located at each stop) to request pick-up. You must be present to request pick-up. UC Davis Medical Center on-site shuttle services are for persons affiliated with the University of California (this includes faculty, staff, students, interns, volunteers, patients, and visitors). There is no charge for trips around the UC Davis Medical Center campus. Inter-campus services are also available, for a small fee, between the Davis and Sacramento campuses. Click here for Inter-campus shuttle information. UC Davis Health's MedTrans (On-Site) Shuttle service offers convenient transportation within the UC Davis Medical Center campus. 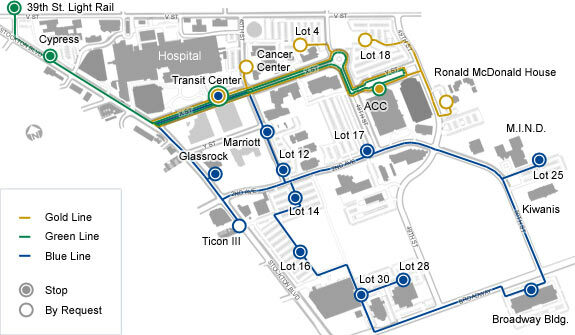 Routes connect the hospital with various buildings, parking lots, and other locations within the Medical Center area, including public transportation.